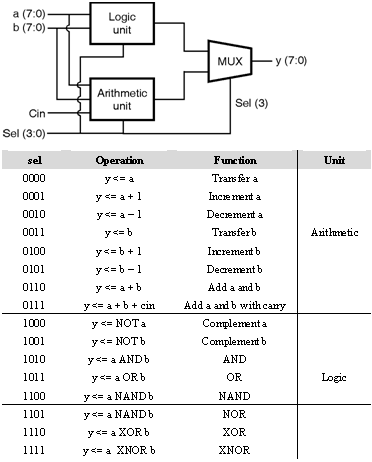 An Arithmetic Logic Unit is shown in figure below. It is a circuit of executing both arithmetic and logical operations. The operation is explained in the truth table. The output is selected by the MSB of sel, whereas the specific operation is selected by sel's other three bits. Two signals, arith and logic, are used to hold the results from the arithmetic and logic units.